No one will ever guess this quick-to-stitch little zip-top bag is made from recycled fabric selvages. 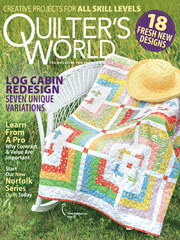 This e-pattern was originally published in the February 2010 issue of Quilter's World. Size: 9 3/4" x 5" x 2 1/4".